Later I was sent to a flak battery located on the west bank of the Oder near the Reichsgarten pub. There were two guns in the position, and from there we were able to shoot up two Soviet tanks coming up the Sonnenburger Chaussee. Several German dead were buried behind the Artillery Barracks at the Reichsgarten pub. When we had run out of ammunition for our guns, or the guns had been hit by enemy fire, I was assigned as an infantryman in the Altstadt. We were accommodated in the Girls’ Middle School on Schulstrasse, which received a direct hit one day that buried twenty-eight of our comrades. We could only dig out seven men alive, and the remaining twenty-one could well still be buried under the rubble. Meanwhile there were conflicting opinions over the conduct of operations between Headquarters 9th Army and Army Group ‘Weichsel’ on one side, and the Army General Staff (OKH) and the Armed Forces General Staff (OKW) on the other. The former wanted, with a new but limited attack, to facilitate a breakout by the garrison, to hold the line established on 23 March, and to put all the divisions available to the task of eliminating the 5th Shock Army’s bridgeheads in the Kienitz–Gross Neuendorf sector. 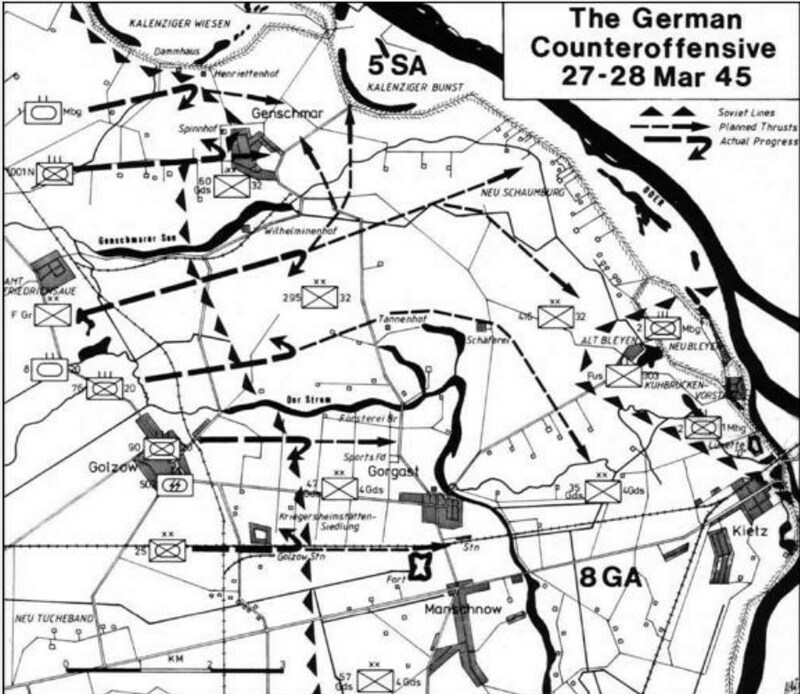 However, the OKH and OKW, at Hitler’s insistence, wanted the fortress to be relieved and ordered an attack to be launched from the Frankfurt Fortress’s bridgehead on the east bank north-west of Küstrin, which, it was hoped, would shatter the communications and forces of the 69th Army and 8th Guards Army holding this sector. This latter plan was known as Operation Boomerang. It depended on getting the five divisions concerned across the single bridge at Frankfurt, a move that could not possibly have gone unobserved, thus eliminating the essential element of surprise. The controversy over this matter eventually was to contribute to the causes for Colonel General Heinz Guderian’s dismissal as Chief of the General Staff on the 28th of the month. When Colonel General Gotthardt Heinrici took over Army Group ‘Weichsel’ on 22 March, the 25th Panzergrenadier Division was supposed to be about to move to the Frankfurt bridgehead in preparation for the attack on the east bank, although the Küstrin Fortress had just been encircled. Heinrici visited Führer Headquarters on 25 March and managed to persuade Hitler to change the plan to a reopening of the Küstrin corridor. The orders to SS-Lieutenant General Reinefarth commanding the Küstrin Fortress were to hold out at all costs, so the reopening of the corridor (with the added but unrealistic goal of reducing the Kienitz bridgehead) was an acceptable alternative to the original plan of attack for Hitler, although Heinrici regarded both proposed attacks as an unnecessary waste of manpower. The date for the revised attack was set for the 27th. To conduct this attack General Karl Decker’s Headquarters XXXIXth Panzer Corps was given the 25th and 20th Panzergrenadier Divisions, the ‘Führer’ Grenadier Division, the ‘Müncheberg’ Panzer Division, the ‘1001 Nights’ Combat Team and the 502nd SS Heavy Tank Battalion. These formations had the task of breaking through the Soviet defences in the sector formed by the Küstrin–Berlin railway line as far as the Oder dyke on the Kalenzig meadows. The 20th Panzergrenadier Division and the ‘Führer’ Grenadier Division in the middle were to thrust through to Küstrin and, together with the forces on the flanks, enlarge the strip up to the line of the Küstrin–Berlin railway/ as far as the Oder near Neu Bleyen/ the Oder dyke at the Kalenziger Bunst/the Kalenziger Wiesen (meadows). On the night leading to Monday [26 March] we lost our left flank protection about 150 metres away. The leader of the three-man section there was wounded. A warrant officer, who was a bit simple but also very brave, sorted out the men. As the enemy situation was not clear to him as a result of the changed circumstances, he simply crept over alone and orientated himself. All went well while he traced the enemy position, but he was spotted on the way back and shot through the thigh by one of his own men. While his comrades were taking him back to the dressing station, the Russians established themselves in the abandoned trench and took us under uncomfortable fire from the flank. The infantry guns, the heavy machine guns, the Hoffmann section, the 88mm flak gun and my section still formed a long, narrow finger into the enemy, from which we were connected to the manor farm only by a trench from the flak position. Our battalion position in the manor farm area was itself only a part of a wedge reaching from Kuhbrücken to the north-west. Night after night the Soviet units moved in closer, spending the day in quickly dug out scoops ready to take another jump forward the following night. With our [MG] 42 machine guns and the necessary supply of ammunition we were able to slow down their rate of advance. Nevertheless we were not able to sleep any more. Only during the day, crouched in our foxholes, could we take a short nap or sink into a light half-sleep in which any change in the position would immediately awaken us. My section received no more cold rations on the last night, only a few canteens of drinking water. The Russians had worked their way forward to less than 100 metres from us and dug foxholes all around us. The night was as disturbed as if daylight had driven off the darkness. The first serious plans for a breakout were developed in the fortress on 26 March, when even some of the SS officers close to the commandant began to feel uncomfortable with their situation. It was thought that a breakout had some chance of success while the encirclement at the junction of the two Soviet armies had still not been fully consolidated and the units there remained unfamiliar with the terrain. The increasing pressure on the small German-occupied strip along the west bank of the Oder, which was the only possible starting point for a breakout, called for haste. At the time of the first brief closing off of the town at the beginning of February, any mention of breakout plans would have led to a court martial. Now, with the indication that the relief attack had been repelled, or at least had been unsuccessful, the situation had changed dramatically. Reinefarth had reasons enough for delaying making a decision. The penalty for disobeying Hitler’s orders was quite clear, and while there was still a chance of the fortress being relieved, he could not claim to have been under pressure. Apart from this, should the ‘corridor’ reopen, even briefly, he could not guarantee reaching the German lines safely, even if he used a tank. The landing strip prepared weeks before for just such an emergency was still in reasonably good order, but could only have been used in daylight by a very skilful pilot and almost every metre of it was now under Soviet observation and even within range of light infantry weapons. This Monday morning the Red Army units made a concentrated attack on the Alt Bleyen manor farm. Katyuschas opened fire, and were joined by guns and mortars. The opening blow was so strong that we could not see the flak position 75 metres away. Because of the proximity of the enemy and his overwhelming superiority in numbers, we had no choice but to keep firing during the fire preparation so that he could not get up to attack. Within a short time four of our six machine guns were out of action with ripped barrels from lacquered ammunition. Our lives depended upon these machine guns. Replacements were needed. To get through the barrage only Fischer, Krell and I were available. The machine-gunners could not leave, so I had to go. I jumped out of the trench and dived into the wall of fire. Suddenly I received a blow, was lifted up and lost consciousness. When I came to, I carefully moved my arms and legs and felt my head and body. Nothing. My steel helmet lay several metres away. Now I crawled on until I reached the flak position, where a sentry pulled me into the trench. I sought out my platoon commander and the gun commander. Together we controlled the gun. It was ready to fire. The crew had so far had only a few wounded. The flak machine gun also began to fire. I took two of its four replacement barrels. Then the gun commander pushed me up out of the trench. This time I was scared and crawled back. Then the storm began on the manor farm. First a Soviet storm troop broke into the trenches of our 1st Platoon, rolled it up and approached the company command post, threatening to split the battalion in two. The company headquarters troop was able to clear this breach in an immediate counterattack using sub-machine guns, hand grenades and Panzerfausts. The troops attacking the flak position were gunned down by the 88mm gun at point-blank range. The battalion commander also sent the three self-propelled guns to our support. They drove right up to the Soviet rifle pits and turned, squashing all who lay there. Immediately the Soviet fire concentrated on our self-propelled guns. When one of them received a direct hit, the others turned back. The firing slowly died down. The noise of combat could only be heard from the dyke road to Kuhbrücken. Here, between the parallel dyke roads to the southern hamlet of Alt Bleyen, a panzergrenadier battalion of the ‘Müncheberg’ Panzer Division was defending itself, together with an officer-cadet company and another dug-in 88mm flak gun, against the tank-supported enemy attack from the north. That afternoon the attackers were able to break through to the southern edge of Neu Bleyen. By evening nine destroyed enemy tanks stood in the area, the officer cadets were down to only a few men and the 88mm gun had been rendered unserviceable. The Russians had reached the dyke road between the manor farm and Kuhbrücken. On this beautiful sunny Monday morning the Soviet artillery resumed firing at us, slowly increasing in intensity. This lasted several hours. Then the ground-assault aircraft appeared flying sometimes in threes, sometimes in sevens. They crossed over our battalion’s positions always in the same order: orientation, dropping bombs, firing with machine guns or rockets. Once one group was finished, another would follow. When the aircraft tipped over to attack, one could only pull one’s head in and trust to luck. The infantry guns were attacked the most. In the afternoon even phosphorus was dropped on them. I was afraid that the Russians would overrun us when the ground-attack aircraft forced us to take cover. But, despite their superiority, the Soviet infantry did not dare to do so. Apparently they had not recovered from their bloody repulse that morning. One had to be unbelievably cautious. My field cap was shot through several times when raised to see what would happen. That afternoon, as the relentless fire from Soviet artillery and ground-attack aircraft continued and it became simply a matter of luck whether my foxhole would suffer a direct hit, I lost my last belief in a higher Being connected with human history. My belief no longer existed, driven out by the fearful development of air attacks on the civilian population and the knowledge that the Christian priests on our side prayed to the same God as the Allies for the success of their weapons. The enemy attack had cost us a lot of ammunition. I had only two Very light cartridges for the coming night. For supplies we had half an iron ration and half a canteen of water per man. That afternoon supply containers were dropped on Küstrin again. With darkness a runner from the company appeared. Because of the losses the division into platoons was cancelled and the number of sections reduced. Half an hour later I was shot in the chest during a short exchange of fire. I reported to my platoon commander, whom I found in the flak position, and went on through the trenches of the Hoffmann section over the dead bodies left from that morning. The Russians were dug in here close to our positions. It was pitch dark. We went slowly past the pond to the dyke road and then along the foot of the dyke, even more cautiously, our weapons ready for action in our hands. For a distance of several hundred metres the Russians were on one side of the dyke and on the other side were our men at long intervals. About 100 to 150 metres from the dyke there was a shallow, weakly occupied trench on the other side of the ‘corridor’ connecting the manor farm with Küstrin. This is where I saw out the rest of the evening. We expected hand grenades to come over the dyke at any moment, but everything remained quiet. The survivors of Fusilier Battalion 303 were able to withdraw to Kuhbrücken during the night, but only by leaving behind the heavy weapons, including the three self-propelled guns. Together with the remains of other units, they took up new positions here as Combat Team ‘Quetz’. When we reached the spider’s web of tracks in Kuhbrücken that night, we met Volkssturm men in the cottages there who believed the Alt Bleyen manor farm to be surrounded. Together with others they had been ordered to fight open the way back to the farm complex and get us out. They were mightily relieved not to have to clear the complex. We went over the Kietz railway bridge to the main dressing station that had been set up in the cellars of the Artillery Barracks on the Island. The doctors could hardly keep their eyes open from sheer exhaustion. One instructed me to take the next wounded transport back to hospital, but when I told him where I came from he fell silent. Then we were sent on into the Altstadt. We passed a large burning building, apparently stacked full of tins of preserves judging from the constant dull explosions emerging, crossed the Oder Bridge and finally reached the auxiliary hospital in the cellars of the Boys’ Middle School. I was allocated the lower bunk of a two-storey air-raid bed and immediately fell asleep. In the evening darkness of 26 March I noticed in leaving the cellar of the Potato Meal Factory that cartridges were on fire in front of the building between heaps of stick grenades. The culprit was apparently a ‘Sewing Machine’, an enemy aircraft dropping bombs. When I reported this, Captain Fischer ordered the fire to be extinguished using sacks soaked in the Oder. Later I was ordered to fetch some firemen. On my return I had just reached the Artillery Barracks when the stack of munitions blew up. The cellar of the Potato Meal Factory was on fire. A wall of fire prevented every attempt to reach those trapped in and behind the rubble. Several of them were burnt alive. Between twenty and thirty men lay buried in the rubble, among them Captain Dahlmanns, Second-Lieutenant Schröter and Corporal Grosch. Second-Lieutenant Schröter should not actually have been in Küstrin. He had been given the job of taking us to the front, and then should have returned to Armoured Engineer Replacement Battalion 19 in Holzminden, as his wound was not yet fully cured. The already mentioned Corporal Hans Dahlmanns thus lost his father, whom I knew as a good man, who had treated me in a fatherly manner. I was also present when Captain Fischer expressed his condolences to Corporal Dahlmanns upon the death of his father. The German counterattack began at 0400 hours on 27 March and after a few hours got halfway to Gorgast and as far as the Wilhelminenhof farm and Genschmar before the German divisions were driven back to their start points with heavy losses. According to the 9th Army’s situation report of 27 March, 5 commanding officers, 68 officers and 1,219 men had been lost. The reasons given included minefields, heavy mortar and anti-tank fire with accompanying artillery fire, well-constructed strongpoints in the individual barns and lack of ground cover. In fact the Germans had given the Soviets far too much time in which to consolidate their positions in a greatly enlarged bridgehead. On the northern flank, with flanking protection from the 1st Battalion of the ‘Müncheberg’ Panzer Regiment, the ‘1001 Nights’ Combat Team started the attack with three infantry companies and a total strength of 390 men and 49 Hetzers; by the end of the attack it was reduced to only 40 men per infantry company, having lost 51 killed, 336 wounded and 32 missing, and having had 25 Hetzers destroyed. According to Captain Zobel, the Hetzers were late getting into their start position, having first to negotiate a railway underpass, by which time the Soviet artillery had been fully alerted. One infantry company of this elite battle group reached as far as the western edge of Genschmar, but at daybreak came under such heavy artillery, tank and anti-tank fire from the Henriettenhof farm, Genschmar village, the southern edge of the Genschmarer See and the Wilhelminenhof farm (the latter having fallen to the Soviets in the meantime) that it was forced to withdraw. Despite the XXXIXth Panzer Corps’ initial lack of success, on the same day at 1730 hours the ‘Führer’ Grenadier Division and part of the ‘Müncheberg’ Panzer Division made a fresh attack on the Wilhelminenhof strongpoint and the wood 700 metres north-west of it, making some progress before having to go over to the defensive. On the morning of 27 March we were told to go from our accommodation in Wallstrasse to the company command post for new orders for the next day. One group of four Volkssturm men set off. We had hardly gone 100 metres when a sudden bombardment took us by surprise. The Russians were firing with heavy calibre weapons on the area we were in. At the same time aircraft were dropping bombs. We sought shelter under a high and thick wall where the Zorn firm stored its coal. The Dawidowski brothers and another comrade from Drewitz sought cover under the third arch of the wall, while the fourth one of our group and other comrades went under another arch and in a somewhat deeper situated building. The coal-yard wall was under particularly heavy fire, and was swaying to and fro from the hits. Suddenly there was a tremendous explosion and a flash of fire. It was a direct hit on the third arch in the wall, exactly where the Dawidowski brothers and the other comrade were standing. This part of the wall collapsed. The men standing under it were buried under the falling masonry and were certainly killed instantly. The shooting increased. It was no longer possible to get through to the company command post. Although the way back to the platoon accommodation was only about 100 metres, I did not get back until evening. There was no chance of looking for the dead and burying them, as next day the Altstadt was to be evacuated following the Russians coming in through the Kietz Gate. So the dead still lie today under this wall. This entry was posted in German Units, Operations by MSW. Bookmark the permalink.